16 thermocouple channels for J, K, T or E type thermocouples. Ideal for long distance measurement with short response times. This multi channel Consort temperature data logger is available for 16 channel thermocouple inputs or 12 channel resistance thermometer inputs. The T8710 can work stand alone using the keypad or in conjunction with a PC. Individual channels can be activated or deactivated as necessary. 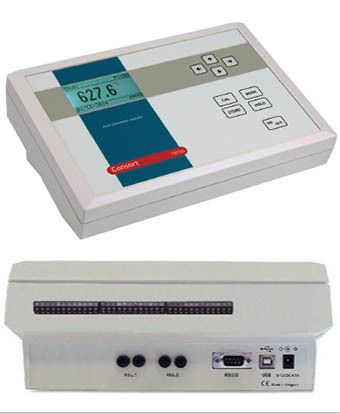 Each channel can be individually calibrated to a specific thermocouple. (they don't all have to be the same type). The information can be stored locally and transferred to a PC or a printer by the RS232 interface. Alternatively the unit can monitor and log data directly to a PC in real time. The display can automatically sequence through the channels showing each in turn. Each channel stores a maximum and minimum value andl has individual high / low alarm levels with buzzer and relay outputs. Connections are made to a terminal strip on the rear of the unit. The terminal strips accept sensors in banks of 8 or 4. Each bank can be unplugged from the unit as a block so that you don't have to re-attach sensor wires individualy. Thermocouples / Platinum Resistance thermometers are not included but can be quoted on request - specify type, length, tip configuration.